A six mile scenic drive winds its way through this hilly 755-acre botanical garden that is a visual delight whichever way you look. Steep curves through dense copse of trees open up on to vistas of ponds, formal gardens and broad, emerald expanses of lawns. The gardens include a greenhouse complex such as the 8,000 square-foot tropical plant conservatory, the Bonsai Collection and Courtyard where some of these exquisitely small plants are over 75 years old and such unique indoor plants as bamboo, banana, cocoa, coffee, sugarcane, tapioca, orchids, hibiscus, gardenias and vanilla. There is also the famed Harper Collection of dwarf and rare conifers with more than 500 varieties, a lake and picnic area. 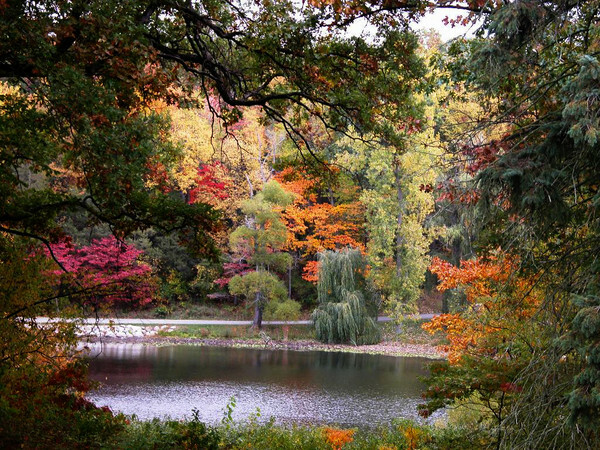 Wander along the five miles of marked hiking trails past thousands of labeled trees, shrubs and flowers. 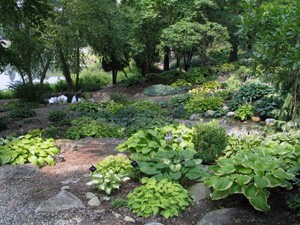 Be sure to stop at the Hosta Hillside where some 500 cultivars are displayed showing off the wide variety of foliage colors, textures, and sizes of hosta. Other shade plants intermingled with hosta along a cascading stream and pond and in the spring daffodils provide a glimpse of the colors to come. There is also a Visitor Center with informative exhibits.